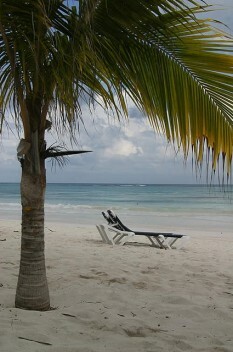 Virtual Photography Studio, “Relaxing on the Beach” April 10, 2011 via Flickr, Creative Commons Attribution. Our first plane ticket is booked and we finally have a “go” date… July 6, 2011. No less than 6 days after our final day of work (June 30), we will be on a plane to Cancun, Mexico. This is going to be a tight schedule to get everything arranged before our departure, but Mike and I agreed that the sooner we could leave, the better. Why Cancun? It was the cheapest flight into Central America – our starting point. It turned out to be even cheaper to fly from Regina than our original plan of busing it to New York, flying to Miami, and catching another flight out of Miami… which means we don’t have to start our trip with 3 days straight on a bus (booyah!). From there we can catch a series of buses to our true starting point… Spanish courses in Antigua, Guatemala. This is a huge step. We now have a date to count down to (86 days, if anyone’s keeping track) which means we can finally post a fancy countdown timer on the blog. Check it out on the sidebar. Aside from vaccinations, this is the first real expense of the trip. The damage: $859.60 for the two of us. However, as we have so diligently been charging all those shots to our travel visa, we were able to apply $150 in travel points towards the plane tickets. So, all in all, we only paid a total of $709.60 to start our amazing RTW journey. Ashley: I’m so excited! I’m actually shaking a little. Mike: Vegas and then Cancun. We’ve got a lot of traveling coming up. Ashley: No $#@! I can’t believe you just said that. We’re going on a round the world trip. Thanks for the link! That school looks like it might be even better than the one we were looking at. We may end up splitting our time between a couple of Spanish schools to see a few different regions of Guatemala. I saw that you posted on Ashley’s website you had friends who attended the cooperative school at San Pedro. Would it be possible to contact them about their experience? A date makes it all very real!! Congratulations…it will fly by! Cheers! Thanks Gillian! Now that it’s booked, I can’t think of anything else (as though I could before). How exciting! Cant wait to read about your adventures and see the great photos you’ll undoubtedly be sharing! Good luck, happy and safe travels…oh and i definitely want to hear about that school in Guatemala! Thanks’ for finding us Stephanie. Took a quick read through your website, it looks like a good resource. Your WAY ahead of the curve for someone planning 2 years down the road. How very, VERY exciting! Congrats on the purchase, now these last few days are going to fly by! Things are going fast. The rumors finally hit critical mass at work today (previously only a select few like my boss were aware of my plans). The trip is really in the forefront of my mind now. Heeey, congrats! Now the countdown really begins! You should know, you’ve only got 6 days left. Wow, time flies by. Congratulations. I bet there is an excitement tickle growing in your tummies day by day. Oh yes, I’m quite giddy at moments. WOOHOOOOOO CONGRATS ON THE PURCHAE & HAVING A SET DATE!!! Ahh its such an awesome/scary feeling when you purchase the tickets. It makes it so real cus now all you have to do is board the plane. We will be missing eachother by a few days. Im ending my Central American trip in Cancun. I will have tons of tips for you so tweet me if you need anything. Thanks, Jaime. I’m sure we will take you up on that offer as the date approaches… That’s one thing I’ve already learned about this traveling thing – there’s a wonderful community of amazing people out there to share tips/experiences with! Excellent! I was just checking out your blog… I think it’s amazing that you’re going on a solo adventure (I’m not sure I would have the guts to do that). I look forward to checking out your adventures as we start ours. It’s good to hear we’ll have someone to tell us all about it before we go. Hooray! That’s 20 days before us… and from how quickly 2011 has gone so far, the time is gonna absolutely fly past! Ooh, our first interview invite. I look forward to it.